These are so stunning. Frenchy and elegant, and so knitterly and clever. I love them! It’s love at first site for me… love these mitts! 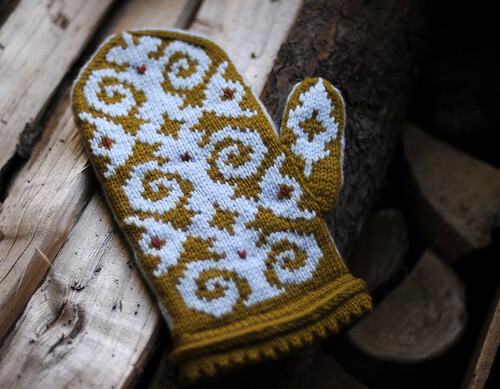 These mittens are gorgeous, and I love the colours you chose for the sample pairs. They really pop together! oh, that picot edge and the color work on the thumb….lovely. Oh. My. GOSH. I MUST LEARN ALL REQUIRED TECHNIQUES FOR THESE MITTENS RIGHT THIS INSTANT!!!!!! I’m in love. And mine must be brown and blue too. AMAZING!!!! Adrian, those mittens are *beautiful*. I adore these mittens. The little picot edge, the same color braid… bliss. I love your pattern and will need to make these as a keeper for myself. What pattern is the sweater on the model? It looks like another good project.